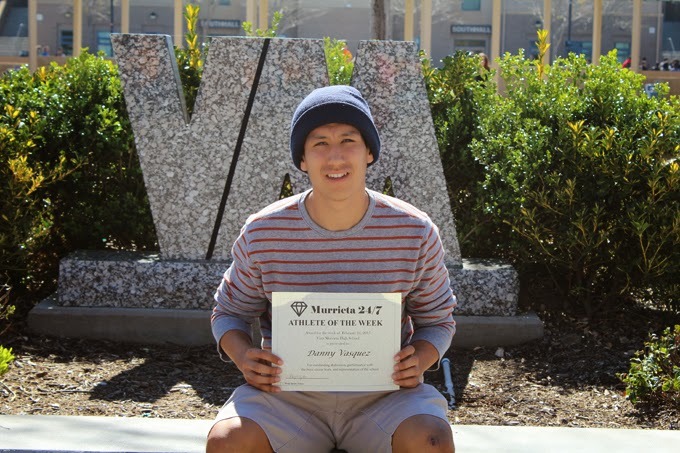 Danny Vazquez was one of two Athletes of the Week honored by Murrieta 24/7. Not pictured: Elise Bengston. Senior midfielder Danny Vazquez, a captain with the boys soccer team, helped lead the Broncos to their first-ever league title last week. He scored the game-winning and league-clinching goal in a 1-0 win over Temecula Valley last Friday. Vista Murrieta will play host to Apple Valley on Friday in the first round of the CIF playoffs. Elise Bengston anchored the defense that enabled the girls soccer team to pick up points in tie games against Chaparral and Temecula Valley last week. The Broncos open the playoffs at Troy on Thursday afternoon. These athletes will be eligible for selection as Vista Murrieta High School's Athletes of the Month, which will be announced the first week of March.